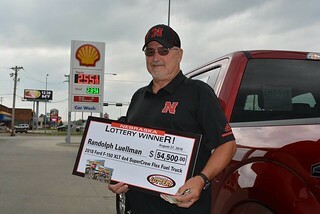 Randolph Luellman is the seventh and final winner of a 2018 Ford F-150 XLT 4x4 SuperCrew Flex Fuel truck in the 23rd edition of the Nebraska Lottery’s $2 Truck$ & Buck$ Scratch game. Luellman purchased his winning Truck$ & Buck$ ticket at Reynoldson’s Shell at 905 S 13th Street in Norfolk. The ticket contained three winning “KEY” symbols in a row in Game 2 for the corresponding truck prize. Nebraska Lottery officials presented Luellman with his prize on Monday, August 27, at Reynoldson’s Shell. Luellman said he bought the ticket while topping off his truck and boat before going fishing. He got some change back and decided to buy a few Truck$ & Buck$ tickets which he promptly put in his pocket and forgot about. Luellman discovered the tickets in his pocket and scratched them in bed when he got home from fishing. Luellman said he took the ticket back to Reynoldson’s Shell to check the ticket. The cashier told him he’d won the truck. Luellman said the cashier was shaking as badly as he was after confirming he won the pickup. He decided to take the ticket home for safe keeping. “For the first three days, the ticket didn’t leave my sight,” he said. Luellman is a fisherman, but he’s also a realist. It would be nice to break in the new truck this weekend, but with the Huskers playing, he might not take it out, he said. The 23rd edition of the Nebraska Lottery’s popular $2 Truck$ & Buck$ Scratch game features the 2018 Ford F-150 XLT 4x4 SuperCrew Flex Fuel truck as its top prize. Players have the opportunity to win one of seven Ford F-150 trucks as well as cash and Ethanol-enriched fuel prizes. The truck prize is valued at $54,500, which includes $1,697 for costs associated with ownership and state and federal withholding paid by the Nebraska Lottery of $2,725 and $13,080, respectively. The odds of winning the top prize in Truck$ & Buck$ are 1 in 300,000, while the overall odds of winning any prize are 1 in 3.24.